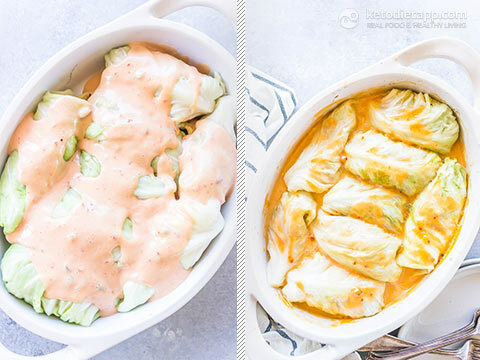 This low-carb casserole is so easy to put together! 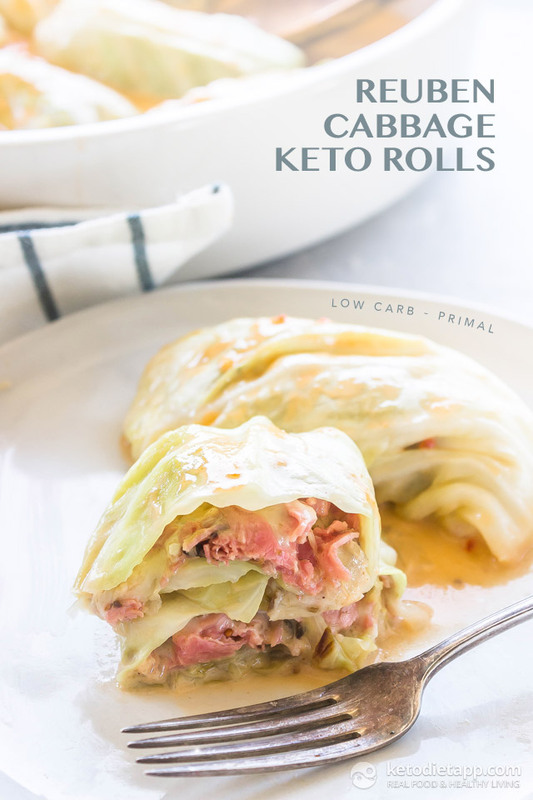 It’s like your favorite Reuben sandwich but without the rye bread, made into a comforting one-pot keto meal. You can use any sugar-free thousand island dressing or make your own using high-fat keto foods. For an extra boost of flavor, you can swap it with the Keto Russian Dressing that also includes horseradish, pickles and fresh herbs. You can use Swiss cheese as filling or even add some shredded cheese on top for an extra crust. Note: Original Thousand Island Dressing recipe from the KetoDiet App. Instead of homemade Thousand Island Dressing you can use 1 cup of any sugar-free alternative. Preheat oven to 175 °C/ 350 °F. 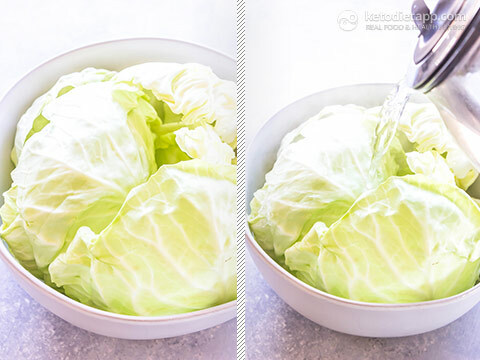 Place the cabbage leaves in a large bowl and cover with boiling water, let sit for 5 minutes (I use an electric kettle to make quick work of this step), alternatively bring a pot of water to a boil and submerge cabbage leaves for 3-5 minutes, until crisp tender. Drain. Make the Thousand Island dressing by mixing all of the ingredient in a bowl. 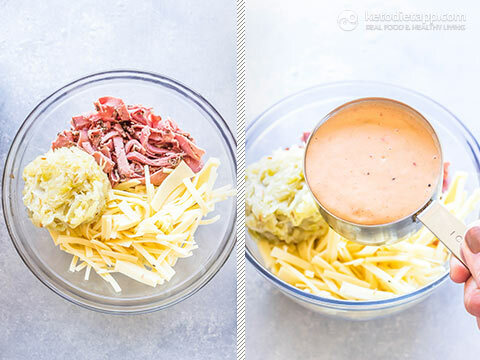 In a medium bowl mix together the shredded corned beef, cheese, sauerkraut, and half of the Thousand Island dressing. 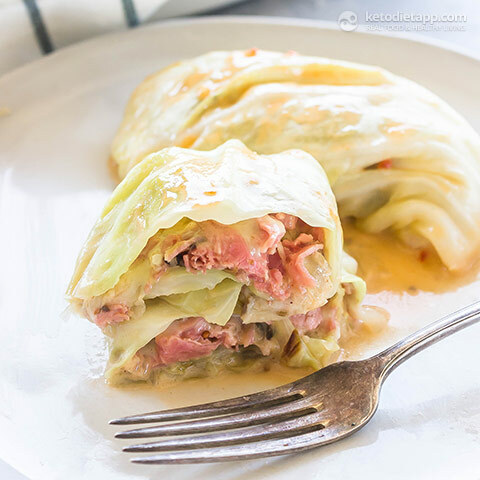 Place a cabbage leaf down then fill with 1/8 of the beef mixture. Roll up tightly and place in an baking dish. Repeat with remaining cabbage leaves. Once all of the rolls are in the baking dish top with remaining dressing and bake 30 minutes. Serve immediately (2 rolls drizzled with some of the sauce per serve). Store in an airtight container in the refrigerator for up to 3 days, reheat in the oven at 175 °C/ 350 °F for 10-15 minutes. I have a question pertaining to the cabbage Reuben’s. 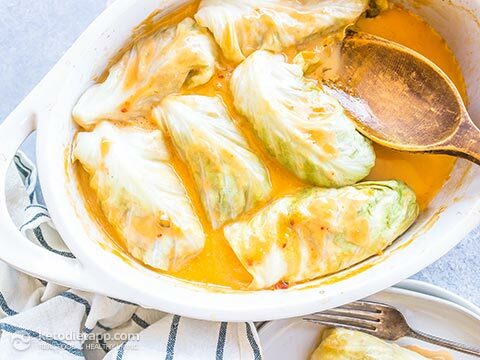 I made these and the cabbage was not easy to cut through or chew, what did I do wrong? Over cook, undercook? Hi Abigail, I think it needed more cooking time. 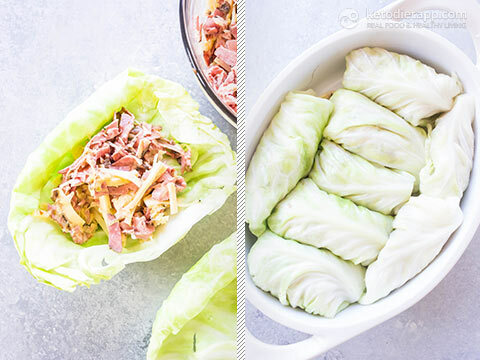 Some cabbage leaves can be quite tough so I'd precook them for a little longer. I hope this helps! Do you know if you can freeze these? I think you could but I don't think it would be exactly the same when reheated. I think the sauce will split.